Featuring the work of scenic designer David Barber and costume designer Loren Bevans. 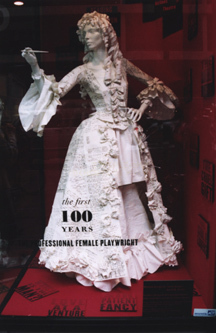 Bevans’ concept for the window takes up where Branwen MacDonald’s First 100 Years print campaign leaves off. Whereas the print images undermine assumptions and exhort viewers to learn more about women playwrights of the 17th & 18th Century, Bevans sought to make a strong link between these artists as women and their words, texts and thoughts by creating a mid-Eighteenth Century paper dress constructed from copies of original manuscripts by playwrights Elizabeth Inchbald and Susanna Centlivre, manuscripts images provided courtesy of the Folger Shakespeare Library, Washington DC. The Drama Book Shop will be in special partnership with The First 100 Years devoting a special section of books (plays, biographies, design books, criticism, etc.) to Women Playwrights of the 17th & 18th Century English stage. SO… don’t stop with just the window; go inside and find out what else you don’t know. Loren Bevans (Costume Designer) designs for theater, dance, opera and film. Recently noted for her work on Juggernaut Theater Co’s Lapis Blue, Blood Red, she has been designing in New York primarily for the last 12 years. Credits include: L’Enfant et les Sortileges, Much Ado About Nothing, Twelfth Night, Hamlet, Romeo and Juliet, Macbeth, The Rover, Nervous Splendor, Ophelia: A Tragedy of Repetitions, Let’s Play Too, Waiting for Lefty, The Lion, the Witch and the Wardrobe. David M. Barber (Exhibit Co-designer) New York credits include sets and/or costumes for Tinderbox Theatre Group, Juggernaut Theatre Company, Classic Stage Company, Blue Sphere East, Rattlestick, Actors Studio Free Theatre, Cucaracha Productions, The Kazbah Project and dance pieces by Gabriel Lansner. Regional credits include sets and/or costumes for Center Stage (Baltimore), The Colorado Shakespeare Festival, Bard College, Action Theater Company, Axis Theatre Company, Splitting Image and others. Production design includes “Woodstock ’99” (FOX Television and Metropolitan Entertainment) and the short film “Also Lies”, directed by Leah Gelpe. David’s work has represented the U.S. in the Prague Quadrennial International Exhibition of Theatre Design. He is a founding member and Co-Artistic Director of Tinderbox Theatre Group.